We went on a mini adventure to Lockhart State Park on Friday. This was a milestone as it is one of the first hikes that my wife has participated in and it will be the blog’s first trip report. The Lockhart State Park is more of a community area than a dedicated hiking area. The park has a swimming pool, playground, rentable community hall, golf course, camping, and hiking. The park has eleven trails, which totals 3.02 miles. In addition, none of the trails are over 0.60 miles so don't expect anything too serious. The park was built between 1935 and 1938 by the Civilian Conservation Corps, a new deal program to create jobs during the Great Depression era. The park finally opened 1948. We parked in the day use parking lot and walked a short distance down a paved road to the Clear Fork Trail. The Clear Fork Trail is 0.47 miles and parallels the Clear Fork Creek for its entire length. The walk was shaded and much cooler than some other trails in the park. During this section of the hike, there are multiple stone-carved dams. The map provided by the park has all the locations of these dams. Unfortunately, no water was flowing over any of the dams I saw. The lack of flowing water is because of the Texas droughts. 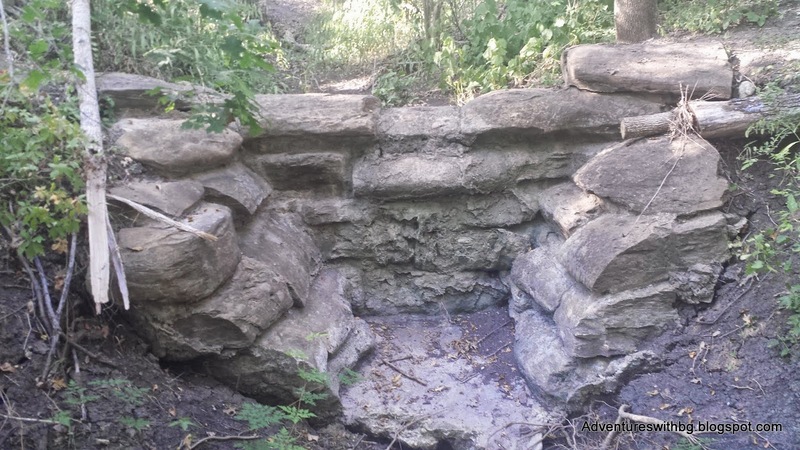 The stone structures are nonetheless worth a short stop to check out. The further into the trail, the closer it brings you to the murky creek water and for the first time ever BeeGee fell into a creek during this section. BeeGee likes to cool off by lying down in shallow water. When BeeGee was checking out the creek trying to get down to cool water, the edge was a little too steep and she slid right in. To make the situation worse she couldn’t crawl back out either. BeeGee swam to the edge, wedged herself between a tree and the bank, and waited rescue. I successfully pulled her out and we continued on our hike, both a little more wet than we wanted to be. The trail ends at a paved road very close to the park’s camping area. To get to the paved road you must cross over clear fork creek by balancing over another dam. Just downstream of the dam is a larger pool where fishing is allowed. 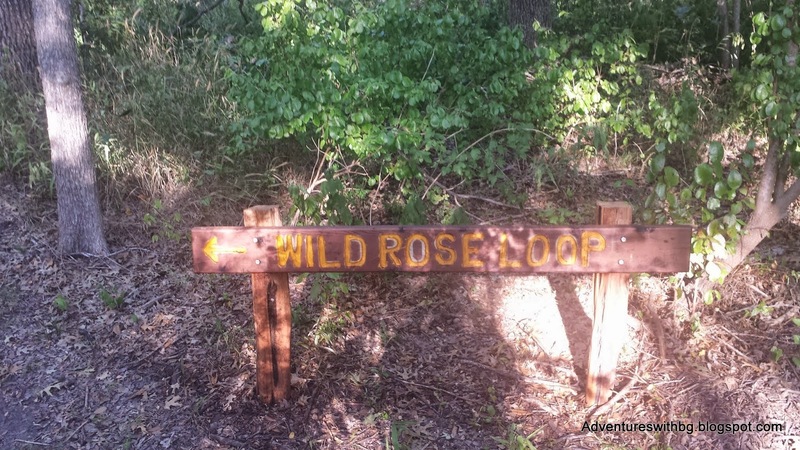 The Wild Rose Loop is a .37 mile loop that begins in the middle of the Clear Fork Trail. This trail leads you away from the creek and into a mix of grassy field and short cedar trees. We took the first left, but I don’t think there is an advantage to traveling a specific way of the loop first because the trail is so short. Throughout the Wild Rose loop, there are McCartney rose bushes lining a good portion of the trail edge. 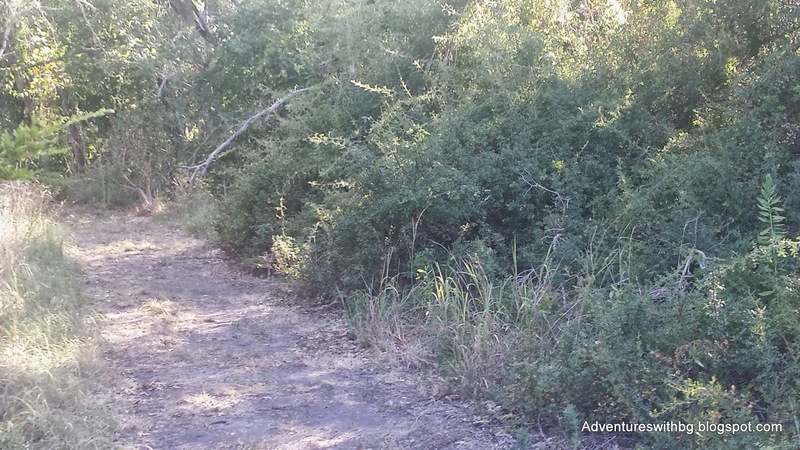 Be careful through because some of the bushes reach out into the trail and their thorns are sharp. The rose bushes were not in bloom, but I’m sure during the right season it is a beautiful sight. 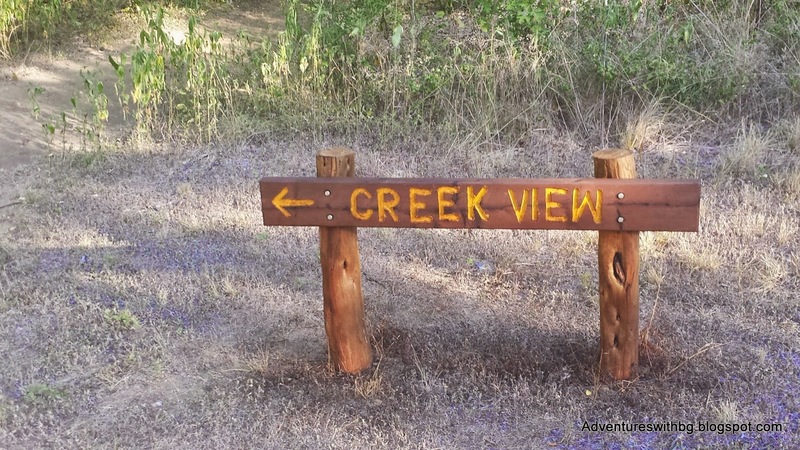 The Creek View Trail is .18 miles long, flat, and very little elevation change. 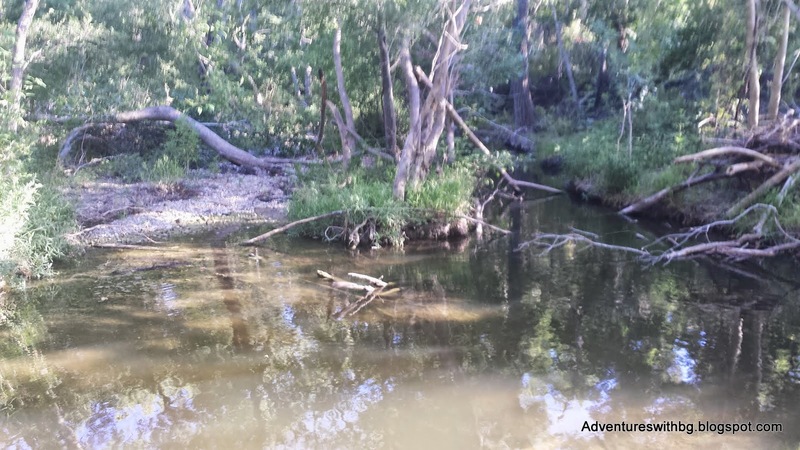 Creek View also parallels Clear Fork Creek; however, it travels along the creek by the way of a 20ft bluff. The view is nice looking down on the creek, but the foliage is thick and it can be difficult to see much of the water below. The nicest thing about this trail is the unique plants. 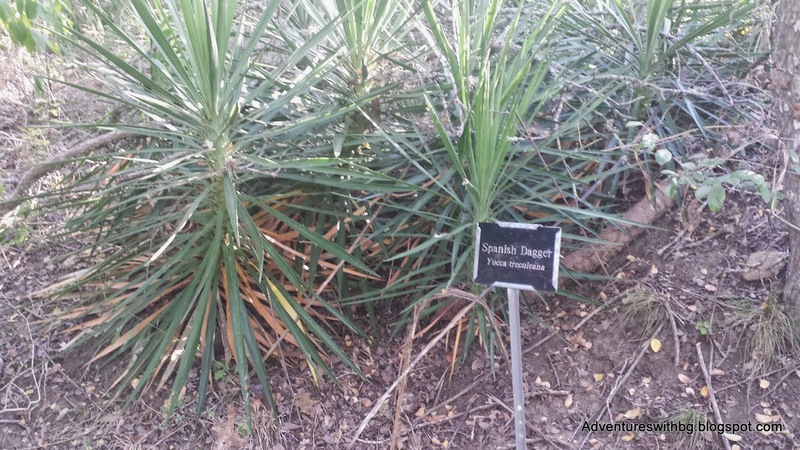 Just past the trailhead there are placards naming multiple types of plants that can be found along the trail. This can be a nice learning spot if you do a little research or bring along a vegetation identification guide. 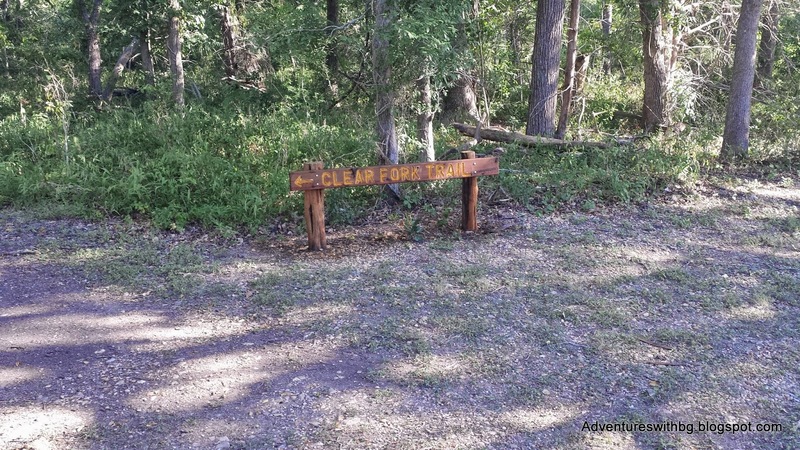 The trail ends at a fork and hikers can take the Fence or Persimmon trails. Our group headed up the Persimmon Trail. This trail is .18 miles long, but has the most significant elevation change in the park. In addition, there are sections with some loose gravel and rocks, so be prepared for a little challenge. The trail is partially shaded but has some sections that are exposed to direct sunlight. This trail has Persimmon trees growing all over the edge of the path. The trees have a black fruit that ripens in late August; however, none had any visible fruit for our trip. Don’t worry; if you don’t know what the tree looks like, they are identified with placards. This area is full of "beggars lice" little seeds that stick to your clothes, or in our case covered BeeGee by the end of the hike. 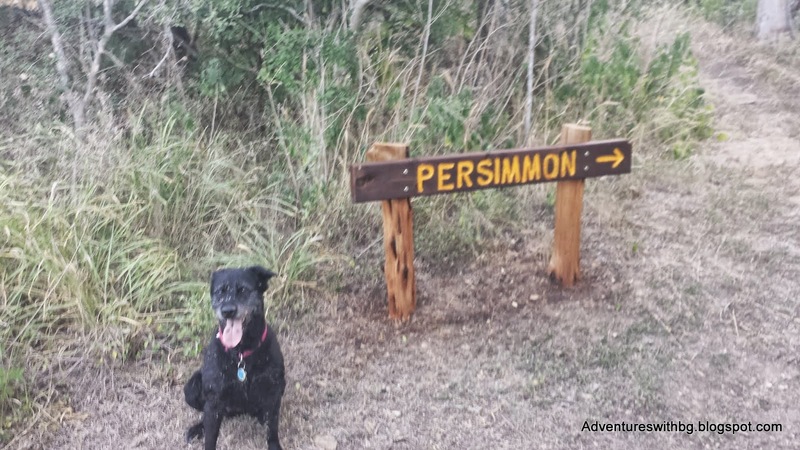 You might even be able to see all of the beggars lice on BeeGee sitting next to the Persimmons trail sign. So be prepared to do a little clean up after walking in the area. The final trail our group traveled on was the Fence Trail. The Fence Trail is .21 miles and has some moderate elevation gain in comparison to other trails in the park. This trail travels along the property edge next to a fence. Hikers can get a glimpse of the terrain change from wooded area to grasslands. This trail was a necessity to get back out of the park and led us back to Creek View. 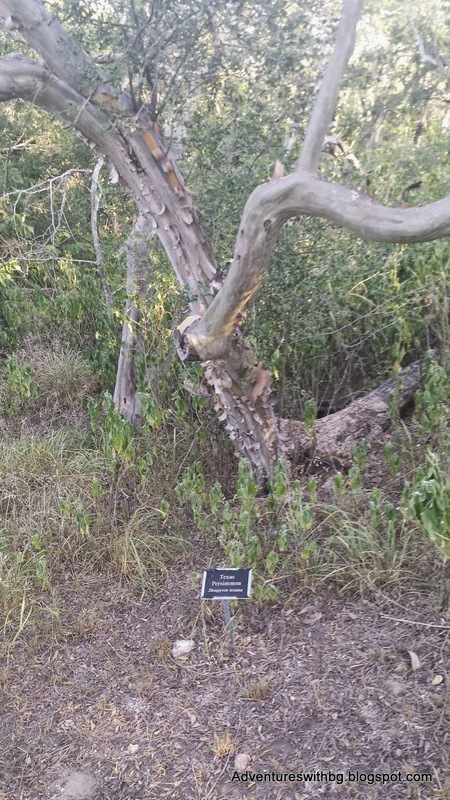 In addition, this trail has a few plant identification placards, but was one of the more boring trails we traveled. Lockhart State Park has multiple things to do with the whole family, from swimming to sports. It is also close to Lockhart where you can get some of Texas’s best barbeque. Therefore, if you are new to hiking or camping and looking for something close to home, I strongly recommend this park. If you are an experienced hiker, I would look elsewhere unless you need to get out to hike and are short on time. If you have ever been to Lockhart State Park, let me know your thoughts and feel free to mention anything I missed. Enjoyed your report. LSP is in my backyard and I did not realize there were so many trails. Kudos to wonder dog for braving the Texas heat!! And I thought Lockhart State Park was just a golf course and pool. Yup, there is a camping area and a decent amount of trails in addition to the pool and golf course. If you are in the area go try them out, it will be worth it.